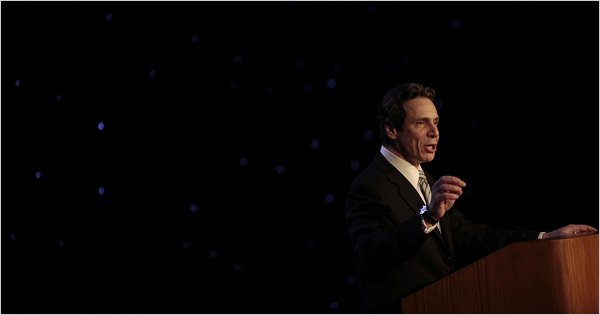 Keep up with the stories about Newly announced Democratic nominee for New York State Governor! Day 1 is too late to change Albany, Andrew Cuomo campaign aides say. Cuomo’s inner circle includes Jennifer Cunningham. Daily News: Cuomo’s “biggest opponents” are “the 139 fellow Democrats” in Albany. Also, Cuomo “must reject” the WFP’s endorsement. New York Times: Democrats should add every AG candidate to the ballot. 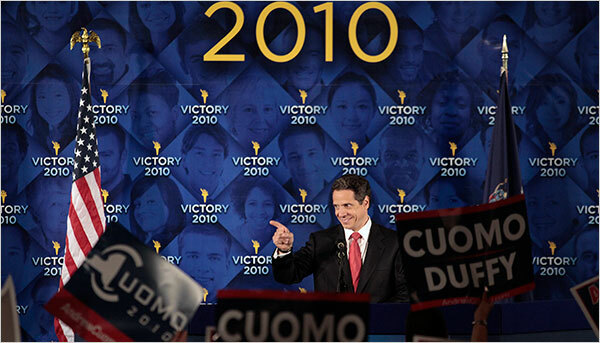 From Daniel G…..New York Governor: Cuomo leads Lazio by almost 3 to 1 ….. The same Pollster who put Gillibrand ahead of Ford by 31 Points has also New York State Attorney General Andrew Cuomo (D-NY) ahead by nearly 3 to 1 over his Republican Rival, former U. S. Rep. Rick Lazio (R-NY). What can I say? I’m getting very worried about the possible Cuomo Coattails in November. Look, without him Republicans would have likely flipped a few House Races in Upstate New York. Now, that’s in serious doubt. NY-20 (S. Murphy), NY-23 (Owens), NY-24 (Arcuri), NY-25 (Maffei), NY-29 (Massa). Those 5 Seats would have a good chance of flipping. Now I doubt it. Remember 2006 when Spitzer trounced his GOP Opponent 2-3 House Races flipped that year. 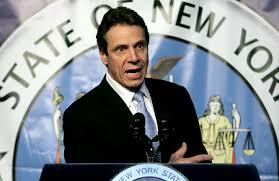 The Next New York State Governor…… Current Attorney General Andrew Cuomo….. is now in the spot light…. For months, Andrew M. Cuomo has silently inhabited a world of grand assumptions: that he was by far the strongest Democrat to run for governor of New York; that his poll numbers were not merely overwhelming but durable; that his fund-raising prowess would turn his inevitable campaign into a juggernaut. Those assumptions excited a lot of people, if for no other reason than that they made him seem an infinitely more attractive candidate than the man who happened to be occupying the governor’s office. Now that Gov. David A. Paterson has abandoned his campaign, however, all those assumptions about Mr. Cuomo — not to mention his record — will be scrutinized and challenged, if and when he does what everyone expects he will in a matter of weeks: quickly wrap up his investigation of Mr. Paterson and officially enter the race. But Mr. Cuomo, 52, is more than just a poll choice, or the payee on the checks of campaign contributors. In three decades of public life, including two prior statewide races, he has grappled with how to present himself, and how much to change: whether to be more humble, or less contentious; how to calibrate his legendary aggressiveness to suit a shifting political climate; when to leap to the attack and when to lay low. On Friday, as Democrats began falling into line behind him, Mr. Cuomo’s supporters pointed to late March or early April as the likeliest moment for him to declare his candidacy. 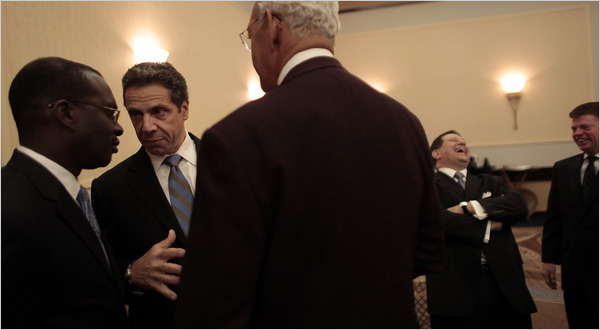 Mr. Cuomo signaled that he would not be hurried into the fray. New York State AG Andrew Cuomo is taking care of his 'Black' problem……in the race for Governor…. As New York’s political world waits for Attorney GeneralAndrew M. Cuomo to make official his run for governor, Mr. Cuomo has been quietly but methodically working to defuse an issue that helped unravel his last quest for the job. Preparing to challenge New York’s first black governor, Mr. Cuomo has been aggressively courting black civic leaders and clergy members, hoping to forestall charges that he is again trying to thwart the ambitions of a prominent African-American in a governor’s race. He met this month with the Rev. Floyd H. Flake, one of New York’s most influential black pastors and the leader of the Greater Allen A.M.E. Cathedral in Queens. The two men discussed Mr. Cuomo’s potential candidacy and the need to have a Democratic ticket that was not made up exclusively of white men. This issue is the only one that could present a bump in the road for the state’s next Governor……. As the Dog posted up here recently…..his numbers are such that politicians around the state are ponying up to the Attorney General, and making nice already……The current Governor has low poll numbers and $3 million in reelection funds verses Cuomo’s $16 million……. Black voters and politician’s can read the signs…..He’s gonna be the next Governor…. The only thing here that the Dog has been annoyed about is the White House…they are in the position to help this problem be solved..it is beyond me why they don’t offer a graceful way for Paterson to step aside ……. New York State AG Andrew Cuomo is taking care of his ‘Black’ problem……in the race for Governor…. From Merlin…..Andrew Cuomo will Announce shortly for New York State Governor…. Big News out of your Home State. Sources telling the New York Daily News that Attorney General Andrew Cuomo (D) will formally announce his Gubernatorial Campaign at the end of March. At last he blinks. No surprise at all. Cuomo basically giving Governor Paterson another 2 months to bow out gracefully. Way back in the fall of last year the Dog advised Merlin and everyone else here and at P1 that Andrew Cuomo will not announce until the late winter or early spring of this year…..That would give Governor David Paterson time to see if he could survive to run for the office he ascended to after Elliot Spitzer hit the road ……Paterson has gone up a few points in the polls but he’s done…After Proposing a new budget with massive cuts and additional taxes and fee’s he’s toast…..
Cuomo will be the next Governor of the state…while his numbers will come back down to reasonable levels…..he is a lock…. Hiss problems with blacks almost 20 years ago will be all but forgotten as people line up to behind him and work to get on his good side knowing that he will remember his friends……..
Also Steve Levy leads Lazio 40-33 and Chris Collins 42-26. Note: Pataki leads also Ford Jr. by a 54-32 margin. In the general Pataki is never going to make it…believe me…his past is going to haunt him..he left the state in terrible financial shape…. Ford is a sleeper…mark my words….I was on point with Rudy….I’m sure on this….. HOLD ON TO YOUR SEATS!…the ride has just begun in the quest for the US Senate seat from New York…..
Well it turns out that the Republicans have come to that conclusion also…….Merlin has tipped us off to the fact that The New York Post’s Fred Dicker …a serious Albany political reporter is now reporting that several key Republicans are asking Rick Lazio to drop his bid for governor and join Harold Ford Jr. in taking on Kirsten Gillibrand…..who will be an easy target….. This turn events can only embolden Harold Ford to decide to take on Gillibrand in the democratic primary since her only friends in the state are Chuck Schumer and left-wing of the democrat’s( unbelievable, isn’t that, with her record!) ……. And judging by the comments on the net’ on the Ford run….people seem to be saying…..’let him run’…..
Poor Chuck Schumer….just when he though he had ‘it’…..’it’ falls apart…..
Gov. David Paterson….it's not about you personally….its about you can't win……. The New York State Governor is looking around for sympathy, for a run at being elected to the job, that was passed on to him ,when Spitzer quit…and he won’t get it…….if he doesn’t remember….. he has no poll numbers…..none…any Republican could beat him, hands down…..and…..right now…New York Attorney General Andrew Cuomo beats any Republican…..
My beef is…Rahm and Obama should grease the wheel by offering the states first Black Governor something to ease the pain on all sides, Paterson, Cuomo, the state’s blacks and the party…..